University of Georgia Press, 9780820326818, 272pp. 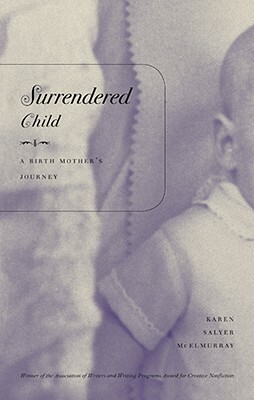 Surrendered Child is Karen Salyer McElmurray's raw, poignant account of her journey from her teen years, when she put her newborn child up for adoption, to adulthood and a desperate search for the son she never knew. In a patchwork narrative interwoven with dark memories from her childhood, McElmurray deftly treads where few dare--into a gritty, honest exploration of the loss a birth mother experiences. McElmurray's own troubled upbringing and her quest after a now-fully-grown son are the heart of her story. With unflinching honesty, McElmurray recounts both the painful surrendering and the surprise rediscovery of her son, juxtaposed with her portrayal of her own mother, who could not provide the love she needed. The dramatic result is a story of birthright lost and found--and an exploration of the meaning of motherhood itself. Karen Salyer McElmurray is the author of two novels, "Strange Birds in the Tree of Heaven" (Georgia) and "Motel of the Stars," and the memoir "Surrendered Child" (Georgia). She is associate professor of Creative Writing at Georgia College and State University, where she is nonfiction editor for "Arts and Letters." She also teaches in the low-residency program at Murray State University.